Vegan Runner Eats » Articles » Carbohydrates or Fat: Which One Makes Us Pack On the Weight? Ever since I developed an interest for nutrition, I’ve had so much contradictory information pass through my brain that I’m surprised that my head hasn’t yet exploded. 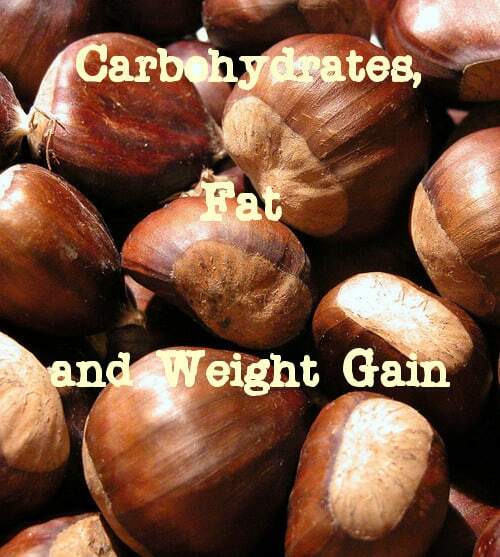 Fat doesn’t make us fat, carbohydrates do! – Carbs are good, eat more of them for more energy! – Olive oil is good for your heart! – Cut out all oil for better health! These days, it’s easy for an average person to get confused while trying to figure out what type of eating behavior is the healthiest. For as long as I remember, I’ve always had a notion in my mind that eating lots of carbohydrates (breads, pasta, potatoes, etc.) could make me gain weight. The proponents of low-carb diets said that all of the carbohydrates we consume turn into sugar, and sugar then turns into fat in our bodies. Early in my twenties, I even tried the famous Atkins diet for a month but soon quit after my energy levels significantly dropped, and I found myself constantly in a bad mood. After carbohydrates happily returned into my diet, my energy and outlook improved. Today, as you may know, I have ditched all animal foods in favor of a plant-based, high-carbohydrate vegan diet, and I’ve never felt better. With all of the (mostly unrefined) starchy foods I consume, I haven’t put on any weight, even though I might exercise less than during the days of my marathon training. Is this logical, you may ask, or am I a freak of nature for stuffing myself with pasta and rice and not packing on the pounds? Recently I was reading some articles on Dr. John McDougall’s site. If you haven’t heard about Dr. McDougall, I highly recommend looking him up (I wrote about his work in this post). He is a big proponent of a high-carbohydrate diet: in fact, he calls his method The Starch-Based Diet. Sure, it may sound contradictory that obese patients start loading up on starchy foods and drop lots of weight under his supervision, but he’s been making this happen for over 30 years. What is de novo lipogenesis? In short, it is a process of turning sugars from food into fats in our body. However, humans turn out to be not very efficient at it. When we eat carbohydrates, they get broken down into simple sugars in our bodies. Those simple sugars then travel to the trillions of our cells, where they are utilized for energy. If we consume too much carbs, they are stored as glycogen (a source of future energy) in our muscles and liver. Our bodies can store up to two pounds of glycogen at once – that’s even more than most carbo-loading marathoners manage to put away before their race. What happens if we eat so much carbohydrates that all of our cells, muscles and liver are full? Does the excess turn into fat? As it turns out, not exactly. Human body is not very efficient at turning carbs into fat. Shocker, right? We are more likely to burn the excess carbs – whatever our liver and cells cannot absorb – through body heat (this process is known as facultative dietary thermogenesis). 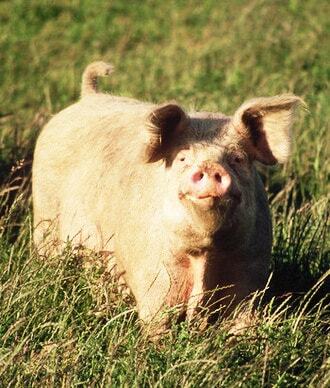 Cows and pigs, however, are much better at it: they convert the low-energy, inexpensive carbohydrates from grass and grains into fat fairly easily. Fat-laced beef and pork are believed to be delicious, so cows and pigs are considered ‘food animals’. Bees are also good at turning sugars (honey) into fat (wax). Dr. McDougall talks about a study in which women were significantly overfed by 50% more calories than they normally ate every day, plus another 3.5 ounces of pure sugar. Interestingly, all that food led the women to gain only 4 grams of body fat a day on average through de novo lipogenesis, which means that they would have to be fed that many calories plus extra sugar for almost 4 months to gain just one pound of fat! If this is true, then where does our body fat come from?! In short, the majority of our body fat results from the fat we’ve eaten. All sources count here, whether it’s meat, dairy, junk food, oil, nuts, avocado… Another shocker, right? Our bodies are wired to hold on to any fat they receive with food out of fear of a famine breaking out any day. Of course, we know that a famine is highly unlikely in the modern times, but we share the same DNA with our distant cave-dwelling ancestors for whom the lack of available food was a reality. Have you ever noticed how hard it is to put down a bag of roasted nuts after you’ve had a few? That’s because our bodies are constantly looking for more fat to put away. After every meal, our body transports the fat we’ve consumed directly to the body fat (adipose) cells. This process is pretty simple: the body spends only about 3% of the calories from that amount of fat to transport it to the adipose cells. To compare, de novo lipogenesis requires 30% of calories to turn sugars into fat. The fat doesn’t even change much as it travels from our stomach to our fat cells: if we sample a person’s fat tissue, we can easily see what types of fat that person consumes a lot. Fish lovers tend to have a lot of omega-3 fats in their body, and junk food eaters have a higher proportion of trans fats. Wait, are you saying that we need to eat less fat to lose weight? Dr. McDougall and other health specialists have seen it over and over: once a person cuts their fat consumption, their body fat melts away, and they become the healthiest they’ve ever been. Oh, I forgot to mention that this works if you follow the whole-food, plant-based diet – any types of meat, even the leanest, still have saturated fat that’s detrimental to our health. You can see a long list of success stories from people who overcame all the odds on the way to becoming healthy for life with Dr. McDougall plant-based, high-starch approach on his site. By the way, I am not paid in any way by Dr. McDougall to spread this info. That’s a bunch of baloney, I gain weight when I eat a lot of carbs! – You gain weight because of all the fat you eat along with those carbs – fettucine alfredo, French fries anyone? Fat is in almost all prepared foods, unless you prepare them yourself with no fat whatsoever, not even olive oil! (See more on olive oil below.) If you eat out a lot, you’re likely consuming tons of fat with every meal because restaurants never skimp on oil/butter, etc. They want you to come back to eat more of their delicious food, and fat wires our brain into believing that fatty food is delicious and necessary – see my example with a bag of nuts above. But I’ve lost weight when I was following a low-carb diet! – Okay, you might have, but have you kept all of it off when you went back to eating the regular way? Low-carbohydrate diets tend to make us lose weight, I’m not going to argue, but this happens only because we push our bodies into an unhealthy condition of ketosis (I wrote about it in detail in this post). Weight loss by sabotaging your health is never a good idea: if you make ‘getting healthy’ your priority, the weight loss will follow. Don’t we need to eat at least some fat? – All foods, including legumes, fruits, and vegetables have some fat in them, and those amounts are enough for us. The body doesn’t recognize fat as an immediate source of energy, so it’s more prone to sending it directly into storage. We don’t even have to eat lots nuts or avocadoes! If you cut fat from your diet, you might enjoy an additional benefit of smooth, clear skin and healthy hair and nails! I’ve heard that olive oil is good for us! – Don’t believe the hype. The oil manufacturers spend plenty of money on promoting their product, and since the majority of people blindly believe what they’re told without doing their own research, they continue to happily pour ‘heart-healthy’ olive oil onto their salads. Oil of all sorts is a highly refined product that’s stripped of the nutritional value of the plant it’s derived from. Don’t believe this? See the label on any bottle of oil and check how much vitamins and minerals it contains. Oil is also pure fat – as you’ve read above, the fat we eat goes directly to our hips. One more point: Dr. Caldwell Esselstyn Jr., a heart surgeon with 40+ years of experience, has proven through research that oil consumption damages the lining of our arteries, which is one of the major factors in heart disease formation. He even wrote a book about it, it’s called Prevent and Reverse Heart Disease: The Revolutionary, Scientifically Proven, Nutrition-Based Cure . Fat-free food is bland! Plus, you’ve got recipes with fats on your site! – I hear ya. Did you know that our taste buds can be addicted to fat? Luckily, they also can adjust to new types of food: we’ve all heard about someone who gave up salt, and then couldn’t eat regular food because he/she found it too salty. Cutting out oil is actually quite simple. When I first started making food without oil, I was surprised at how good my dishes came out even without it. Soups and stews are the easiest to make oil-free if you do the sautéing with some veggie broth or water instead of oil. Also see my post on natural substitutions in baking, almost all of them fat-free. I admit that I have recipes with some type of fat (there’s even one with oil – I’m currently trying to rework that recipe), but as I learn new things about health, I try my best to implement them into my new recipes. In my closing statement, I’d like to say that I am still far from perfect when it comes to reducing the amounts of fat in my diet, but I’m trying! I have been addicted to peanut butter for as long as I’ve lived in the US – it’ll be 8 years in a few months! – and most of my salads have avocado in them. As most things in life, cutting out fat from my diet is a work in progress – at least the knowledge I have now helps me move forward! I hope that now you have a clearer vision about what makes us pack on the weight. For additional information, I highly recommend checking out Dr. McDougall’s site, as well as the site of Dr. Esselstyn and the numerous lectures they’ve given at various conferences through Youtube. Why Low-Carb Diets Have It Wrong. Please take a minute to share your opinion on the subject in the comments below! Want to see more posts like this? Stay in touch with Vegan Runner Eats by subscribing in the top right corner of this post, or by following us on Facebook, Twitter, and Instagram! Tagged Caldwell Esselstyn Jr, carbohydrates, health, John McDougall, low-carb diets, starch-based diet, whole food plant based diet, whole grains. Bookmark the permalink. 17 Responses to Carbohydrates or Fat: Which One Makes Us Pack On the Weight? Thank you for the article. I wanted to praise you for your comments about how you still eat oils, avocado’s, peanut butter, etc. It IS a work in progress. The important thing is that you recognize it and are working on alternatives. Your choices are better than animal fat. I hope this encourages others to keep working at improving their lifestyle because it is a lifestyle you are working towards not an overnight quick fad diet. Keep practicing and it will become a habit. Thank you Brenda! I agree that this is a work in progress, and we are much better off going towards our goal slowly than not going at all. Recognizing that oil is empty calories was really tough for me, because I had been conditioned to approve of it for so long, but once I got past that mental barrier I was able to see how crummy I felt when I ate a lot of it. I’m so thankful for that! Shannon, I was amazed at how easy cooking with no oil turned out to be, and how much better I feel when I don’t eat any oil. I love peanut butter too. Try “PB2” by Bell Plantation. I get mine at Target in northern CA. Ingredients: roasted peanuts, sugar, salt. Nutrition facts: 2tbsp 45 calories. Fat calories: 13. 5g, fiber 2g, sugars 1g, protein 5g. Kosher, from Georgia. Mix with a tiny bit of water…fantastic. Try PB2. At Target in northern CA. Nutrition info: serving size 2 tbsp. Kosher, Georgia , Bell Plantation, add a little water..delicious!! Margaret, I heard about PB2 but haven’t tried it yet. Great post! Lots of good information. I am still trying to find PB2. I saw where Publix carries it. Thanks Jaime! I think I saw it at Publix too, but the price kind of turned me off. Great Post!!! I love Dr. Fuhrman’s Eat to Live Plan (plant-based), but this goes beyond it — I have just been implementing this for a couple days and really think that Low Fat, Plant-based is the way to go. I love the information you shared on the de novo lipogenesis science, and the amount of glycogen we can store in our muscles. Yeah, that’s not going to turn to fat if our muscles need it.. This is a very well-written explanation of McDougall’s findings. I am looking into his research as well! Thank you Rebekah, glad you found this post informative! I wish I had good news about Dr. Mcdougall diet working for me…but I don’t. I eat no nuts, or oils or dairy or animal foods or sugar or dried fruit. I ONLY eat whole grains, beans, veggies and fruit and constantly eat as no matter how much of his food I eat I never feel satisfied. I have GAINED 4 pounds and 3 inches in my belly and I’m so unhappy about that. My former diet was animal protein, fruits and veggies and I was always thin. I’m so conflicted what to do. Eating lots of whole grains and beans and fruit will pack on the weight no matter what the doctor says. I read about AJ on Dr. Mcdougall site and how she gave up all nuts and lost lots of weight, but I don’t even eat nuts. I think the high amount of healthy whole starches from the beans and grains affect your insulin levels negatively whereas animal protein does not. Thank you for the insight, Jenna! I admit that it’s possible that McDougall’s diet may not work for everyone since we all are different, plus there can be any number of factors that also affect our health and weight – stress, lack of sleep, thyroid function, etc. I am not a health professional, but it may be a good idea for you to see one to find out what’s going on. Jenna, you might find help at a website called potato strong. Will has a trouble shooting video that I found very helpful in the beginning when I wasn’t loosing. I was thinking the same as you but I worked out the kinks and have lost 25lbs now! It is just slow going at times. For fullness that lasts try eating potatoes many agree they offer lasting fullness better than grains. Wishing you luck! Oh also when transitioning to this diet I had a lot of stomach stuff going on too. It went away once my body adjusted to all the extra fiber and bulk. You might also want to look at possible allergic reactions. When I eat gluten I look like a squirrel with a mouth full of nuts yet I am not celiac. If you are coming from a diet devoid of grains is it possible you could be reacting to one of them? My conventional doctor actually theorizes that I am allergic to meat and dairy based on the fact that on the strictest low carb diet I gain weight yet I eat as much quantity as I like plus sugars occasionally on this one and I can lose. Thank you for sharing your experience, April! It shows once again that we can be quite different. does unsaturated fats also make to gain weight.